Fun fact: my first ever Android device was a tablet. A first generation Samsung Galaxy Tab. Over time, I bought three more tablets, the latest being a Samsung Galaxy TabPro 8.4 (WiFi). But now it's time to retire the device, and I won't be treating myself to another. What went wrong with Android tablets? It was actually quite predictable. A few months ago I'd been complaining about the lack of choice when it comes to high-end tablets. And now, my Android tablet is about to get the boot. My reason begins in late fall 2016. At some point before Christmas, I placed my tablet on a bookshelf temporarily. I did this to hide it from my son who had recently pulled everything out of the desk. I haven't touched the tablet since. A few days ago, I made the decision to abandon it entirely. The remaining data will be backed up, the device reset and then resigned to the closet or given to relatives. The last option would be ideal, given that the tablet still works. Why get rid of it, though? For me, it's just a matter of having a clean break. The tablet doesn't do me any good when it's lying around unused. And, if I retire it, then I don't have to put in the effort to update apps and firmware, or charge the device on the rare occasion when I actually want to use it. As the tablet is still running CyanogenMod, updates are always available, but first, I'd have to migrate from CyanogenMod to Lineage OS. It seems like more trouble than it's worth. I simply don't have any real use for the the tablet in my daily life. Surfing the internet? I can do that faster on my smartphone, and quicker still with a laptop. Typing up documents for work? Without a laptop I'd be lost - tablet keyboards don't cut it for me at all. Watching movies or television shows? I'd rather use the television. I could go on. One use case remains: gaming. But, most mobile games are optimized for smartphones. I do have a few games on my tablet, and of these, only Broken Sword has been a faithful companion. I've been puzzling through that 90's adventure for over two years now. This game would be the only reason to keep the tablet, which isn't a very convincing argument. The tablet originally suited me just fine, but suffered from two problems. Android never updated the version, citing 'KitKat stays KitKat', or something to that effect. The second issue was how even CyanogenMod with Marshmallow would jerk in the launcher. It wasn't terrible, but it was still enough to annoy me. Nevertheless, looking back at our list of the best Android tablets, I'm left feeling a little wistful. At the moment however, I just can't see a benefit of having such an expensive gadget in my life. The Yoga Book could be interesting, but the Intel processor isn't ideal for my gaming 'ambitions'. The Pixel C is appealing but, like the Galaxy Tab S3, it's still too expensive for me. Although I'm a little relieved to be rid of the TabPro 8.4, I'm also somewhat sentimental. For the first time in a long while, I won't have a tablet. Tablets will return to my agenda only when either high-end hardware comes at a reasonable price, or when a device offering real value against the laptop/smartphone combo appears. Do you have a tablet? How useful do you find it? Let us know in the comments below. Steve, let us know how many days you can last without it! Will do Brittany. I think the first couple of weeks are the toughest then I am hoping it gets easier. Reading back it kind of makes me sound as if I am some kind of addict giving up his fix. It is tough though as something that has been part of my internet life for past 5 years ain't there anymore. Ha. I will keep you informed. Thanks for the interest. OK, here we go, you asked for it... drum roll please.... I HAVE GONE BACK TO USING MY TABLET!!! There you have it. Hey, what's with all the BOO'S? After not using it at all since the 3rd May (9 whole days) I have gone back to my Samsung Tab A 10.1. Reasons are many. I prefer the larger screen. I subscribe to quite a few digital magazines and though I can read these on my mobile the 10.1 size is so much easier. As a 50+ Web surfer ( No not a silver one thank you) the eyes aren't what they used to be and even with glasses I found myself squinting. And now my tablet shall be getting the latest Android update, as announced in the news yesterday, so I couldn't be happier. Don't get me wrong. My smartphone is always in my back pocket when I am out and about but now I do all my browsing at home with the tablet. One of my favourite YouTube tech reviewers has been using a BLU phone for past couple of weeks and has really enjoyed it so I have ordered one too. The BLU 5.5 inch Life Max to be precise. I don't agree in paying £700+ for a phone and am very much in the budget bracket so will enjoy playing with this. Thank you again for a great article and I have to say that AndroidPit is one of the BEST news and reviews sources around. You will see me spending a bit more time in the Forum pages, using my TABLET!! Haha. Thanks for this article. I gave up my tablet yesterday, May 3rd 2017. I have been using a tablet for past 5 years. Always Samsung starting with the Tab 3 7inch, then recently with a Tab A 10.1inch. Never went for the real expensive versions as money never been there for wasting in such a cavalier manner. Been using it less and less last 3 months. I do everything now on my Moto G4. Yep, no flagship for me either. Who can justify £700-£900 for a phone and 2 year contracts are so last year. As it has only been 24 hours I still feel that I have lost an old friend. The tablet now lives in the bottom of my bedside cabinet so not too far away. I guess I will feel better as the days go by then it's a reset and on eBay for sale. Goodbye buddy. R.I.P Tablets. Thanks. Getting used to this one device does everything mentality is driving me nuts lol. I will get there in the end ha. Longer battery life without killing phone waiting for phone call. Plus being truck driver I use it to do electronic logbook. What can a tablet do for me that a PC, or smartphone can't? Nothing that makes it worth justifying the purchase of one. I got a Chromebook Plus a few months ago and haven't charged my Galaxy Note 10.1 tablet since. I guess if you don't read, this is a viable choice; movies on a tablet (or phone) are a joke; but I read, a lot, and I always have a 7-8" tablet in my jeans picket when I'm out and about. My family uses the larger Pixel/Nexus/Galaxy phone models, so we all have large, hi-res screens on our phones, but we all have lightweight tablets because the increase in screen size makes the reading experience, whether it's a "paperback", a blog app like Feedly, or just browsing a web site, so much better. We got rid of all our larger, 9-10" tablets because the size and weight meant that they weren't suitable for mobile use, and a convertible Chromebook with Play Store, like the original ultra-portable ASUS Flip or the new Samsung Chromebook Plus, provides a much more flexible solution. (4) a 6" 2560x1440 (16:10) superAmOLED screen BLU Pure XL cell phone. (5) a 8.4" 2560x1600 (16:10) LCD-LED screen Samsung Galaxy Tab Pro 8.4 tablet. I agree with the author that the Tab Pro 8.4 is ready for retirement -- it runs on KitKat, has limited RAM and ROM, and is relatively slow compared to newer tablets. And the Tab Pro 8.4 isn't that much bigger than my 6" phone. In fact I retired mine last year. However, I disagree that tablets are dead, and that no viable replacement exists. Samsung's high-end Tab line (Tab Pro 8.4, Tab S, Tab S2 (1st generation), Tab S2 (2nd Generation) evolved way past the Tab Pro 8,4. 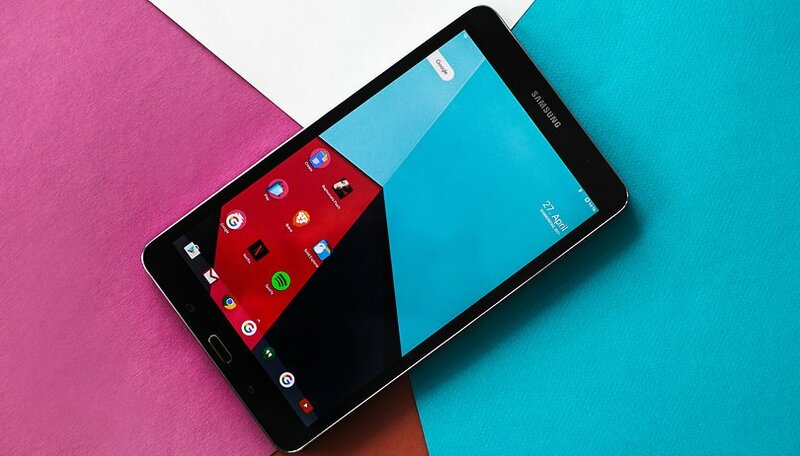 The latest Tab S2 is arguably 4th generation, and one hell of good tablet -- maybe the best on the market. And maybe Samsung will even upgrade the OS from Android 6 to 7 (hope so). If I am at my desk, I use my PC mostly, and the tablet is supplemental. If I am away from my desk, but around the house I grab the tablet to continue whatever I was doing on the PC, or watch a TV program, If I am mobile on the go, it depends where I am going and if I am going to be sitting around waiting. If I am just going there and back quickly, I just take my phone. But if I am going to be there awhile (like waiting for my wife while she shops) then I also carry my Tab S2 9.7", which, because of the different aspect ratio, is three times the screen size of my 6" phone. In fact, the 3:4:5 aspect ratio of the Tab S2 makes easier and better browsing on the internet, than does the 16:9 aspect ratio of the PC screen. I do not like the 16:9 aspect ratio for a computer screen. I'm an Android phone user, but when it comes to tablets the iPad is the only way to go IMHO. I only use my Tab S 10.5 for a few games and to watch tv shows/movies when the power goes out in the house, apart from that is barely gets used. I got a ASUS tablet in January, and retired it in early April. At the beginning, I used it to watch movies or so in the bed. But gradually I didn't used it much. Since watching movies or surfing the internet with laptop is much convenient. If you say gaming? I will say playing game on my phone will be funnier. So the tablet was left unused since then. Then came to the end of March, when I booted it up I found it was unable to connect to WIFI. So it was fired. I use a tablet for the larger screen cause I'm old. And don't want to lug more than a pound or so of weight. Frankly, my 7" tablet is the go to device around the house - and has most of the apps I use - while the 5" phone sits waiting for calls or SMS (recently terminated the landline) or to go out. I just like the bigger screen both for reading and keyboarding, yet unlike a laptop it's small enough to move around conveniently. I'm completely unwilling to either pay for or pack around a phablet-sized phone - certainly can understand that tablets are redundant to those, and my guess is the writer has one.